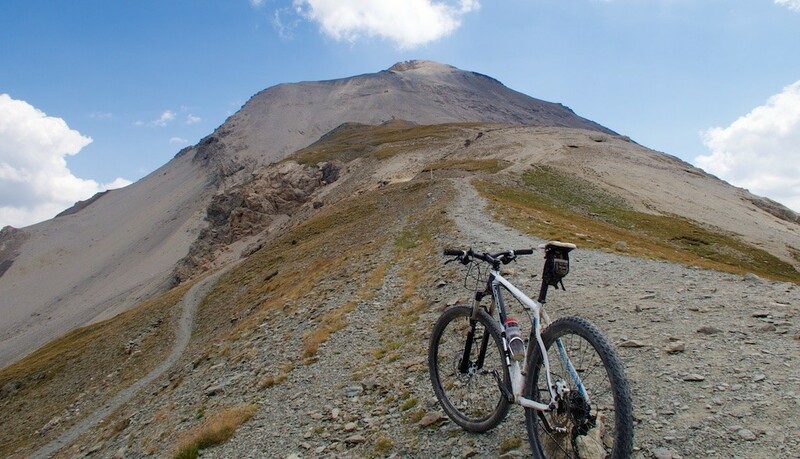 This is the highest I have ever been with a bike – 3,131 metres. A dream. 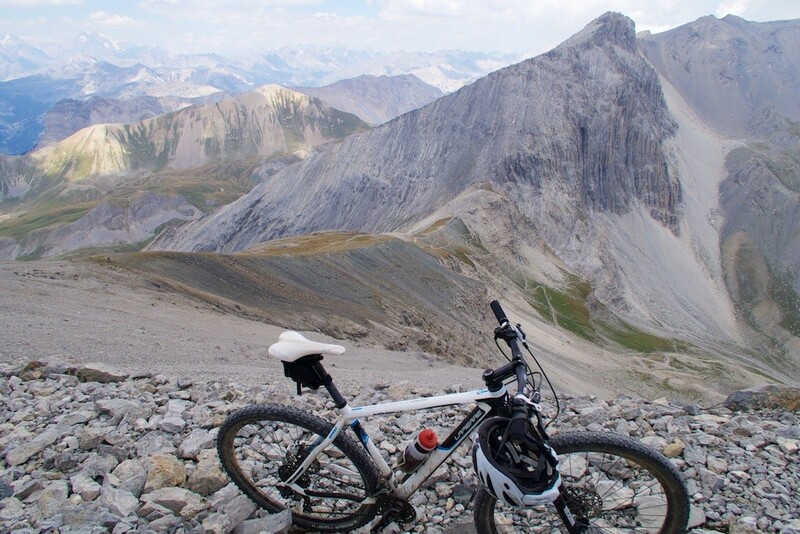 EDIT: I have since cycled Col du Jandri – 3151 metres. Mont Chaberton is part of the Massif des Cerces in the Hautes-Alpes department of France. Formerly in Italy, the Fort at the very summit (the highest in Europe) was built by the Italians between 1896 and 1910. After World War Two (1947) the border was moved and Mont Chamberton became part of France. 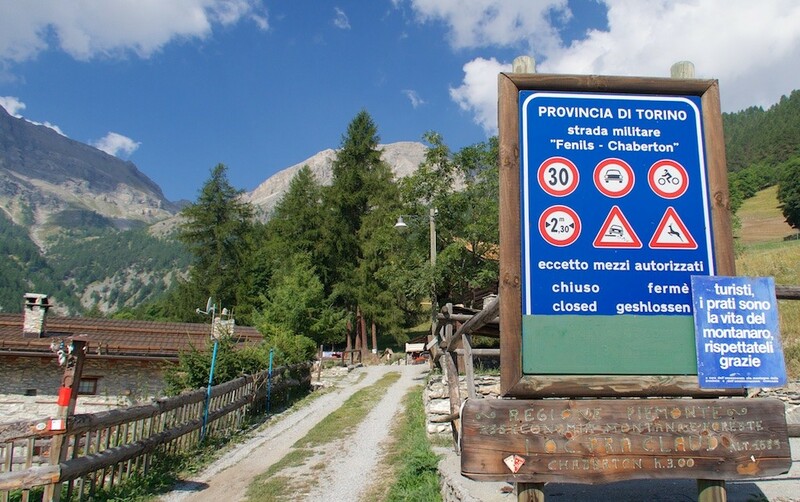 The old military road begins in Fenils, Italy (1295 metres). Astonishingly, it is only 13 kilometres to the summit. This is a brutally difficult climb. And even the strongest cyclist will spend most of the 2nd half pushing the bike. Not only due to the steepness, and altitude, but also due to the slippery, rocky surface. Above Fenils the paved road soon ends. A couple of kilometres higher, at Pra Claud, the road is closed to motorised traffic (since 1987). Perfect. 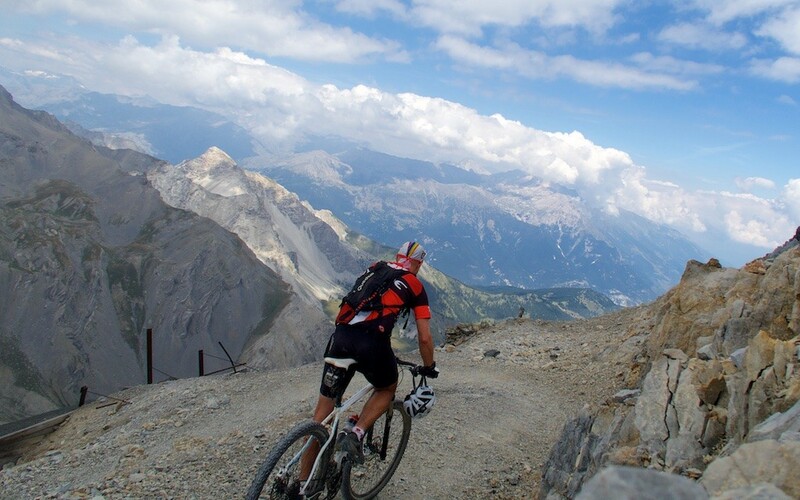 The first few kilometres are steep but ride-able, through alpine meadows/forests. Expect some sheep and cows. But as the road reaches 2000 metres, it becomes steeper, and rougher as it gets above the tree line. This was my 3rd time reaching 3000 metres by bike. 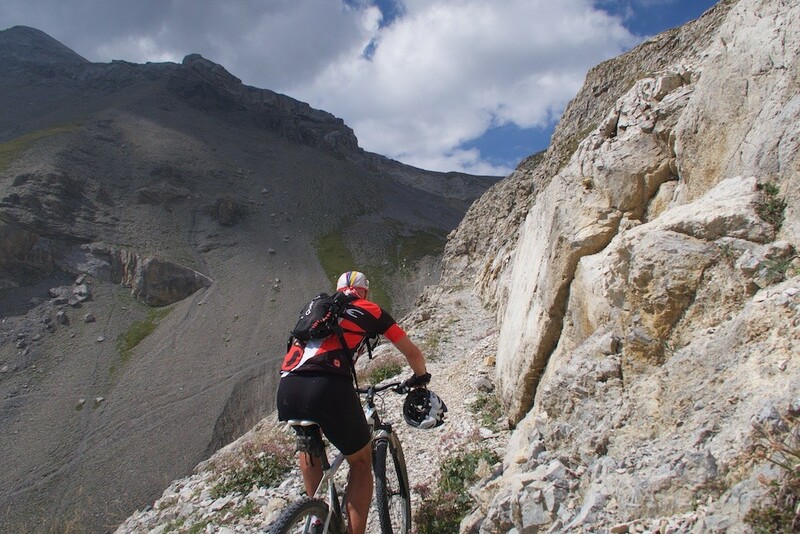 The best of the three is probably Colle del Sommeiller because the entire route is ride-able. But Col du Caron is very fun as well. From here on I would only be cycling “opportunistically.” Often slipping whenever I tried. But it’s an amazing atmosphere and route, so I was enjoying myself, despite pushing my bike for most of the way. The current France/Italy border is near Clot des Mort (2457m), named for French soldiers that froze to death here in 1795/6 during the war between France and the Kingdom of Sardinia. 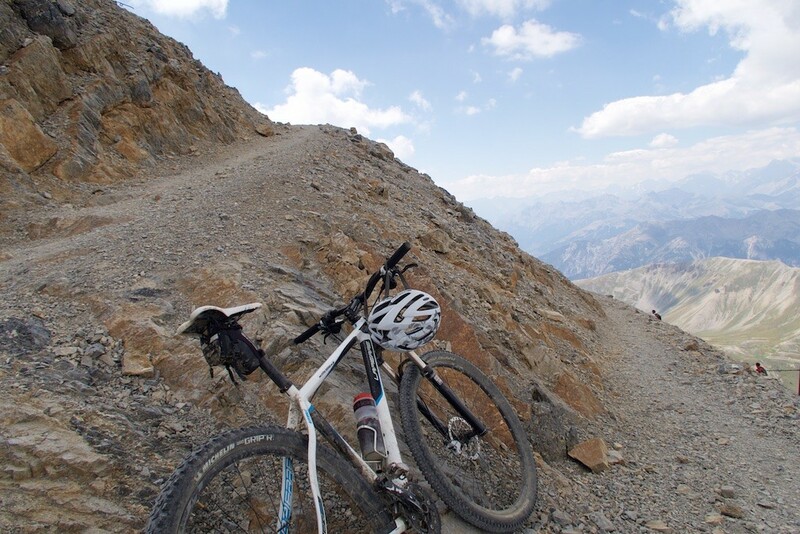 The road climbs relentlessly up to Col du Chaberton (2674m). Briefly, choosing a track becomes slightly confusing. In 1905, the “road” was lengthened here to make it less steep, and it seems parts of both remain. The second highest Fort in the Alps is nearby: Fort Jafferau is a similarly spectacular cycling climb, and more ride-able. Details here. From Col du Chaberton until the summit there were some hikers as they usually climb from the (French) far side of the Col – the way I would later descend. Looking up from here: I still had a long way to go. 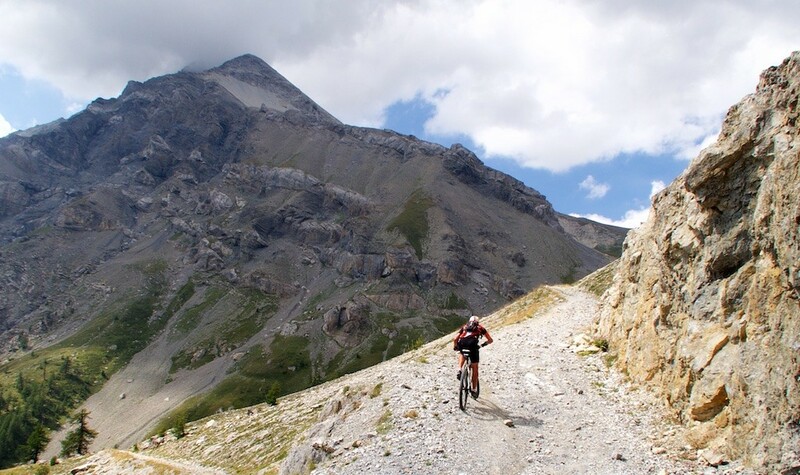 The final kilometre above 3000 metres is lung-busting. But I finally reached the summit. The summit of the mountain was flattened and lowered by 6 metres to allow the construction of 8 towers. Each tower was manned by seven soldiers and a 149mm artillery gun. During World War 1 the guns were removed and used on the Austrian front. But during World War 2 the towers were re-armed. Italy entered World War 2 on June 10th, 1940. 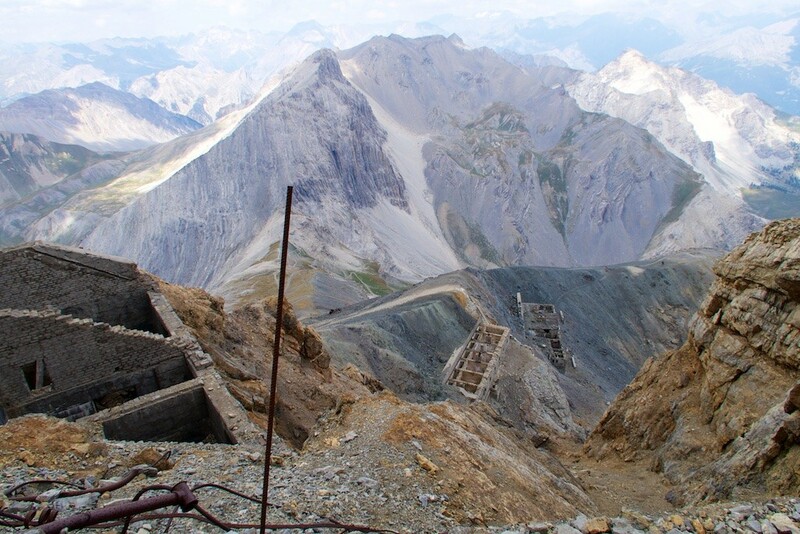 On June 20th they began bombarding French positions around Briançon from Mont Chaberton. But the next day, French artillery batteries, hidden in nearby – far lower – peaks, managed to knock out six of the eight towers killing 9 and wounding 50 Italian soldiers. Four days later, France would surrender to Germany (and thus Italy). After the War, it was General de Gaulle that insisted on Mont Chaberton being included in the Italy peace treaty land settlement. 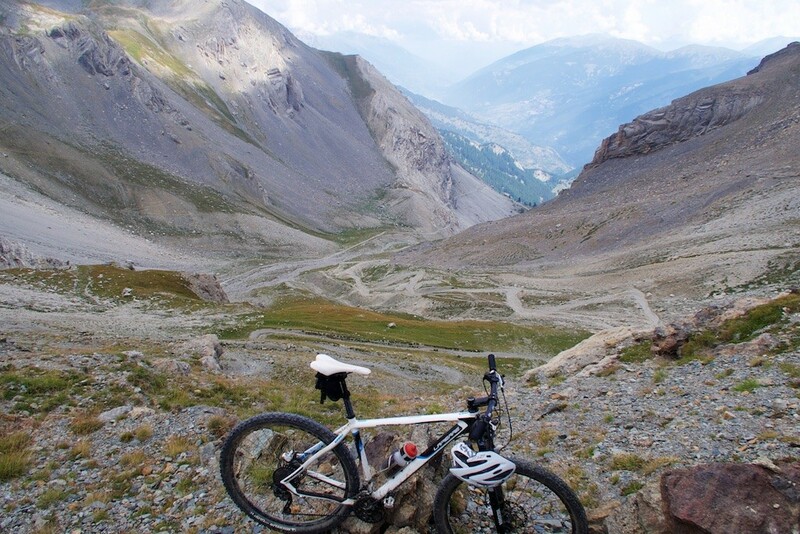 The descent back down to Col du Chaberton is generally ride-able, even for me. At Col du Chaberton I descended the far side. 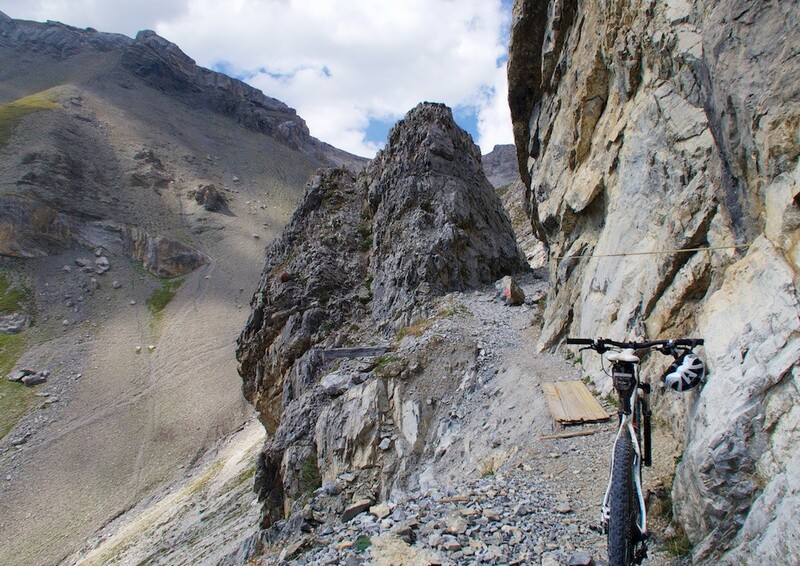 For a kilometre or two this is an extremely difficult descent (un-ride-able). It’s technical even for hiking. I do NOT recommend coming up this way by bike. Impossible to ride, and difficult even to carry the bike. But I cautiously made it down without incident. 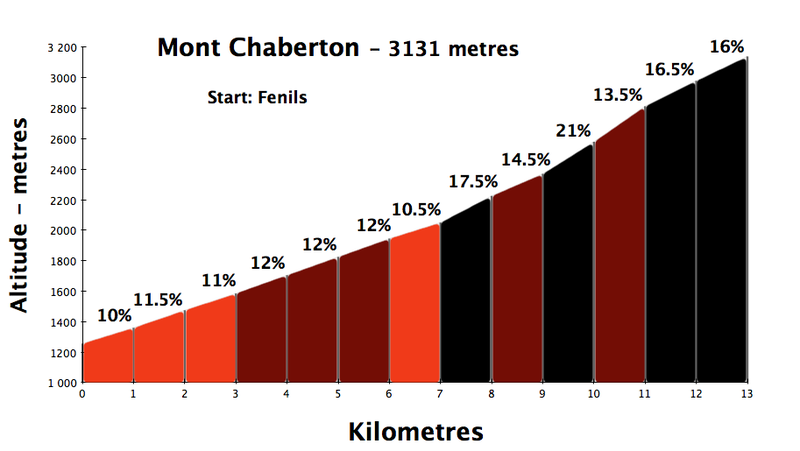 Col du Chaberton above. Very tricky descent — on foot. Next I joined an unpaved but good quality road that descended down to Montgenèvre. 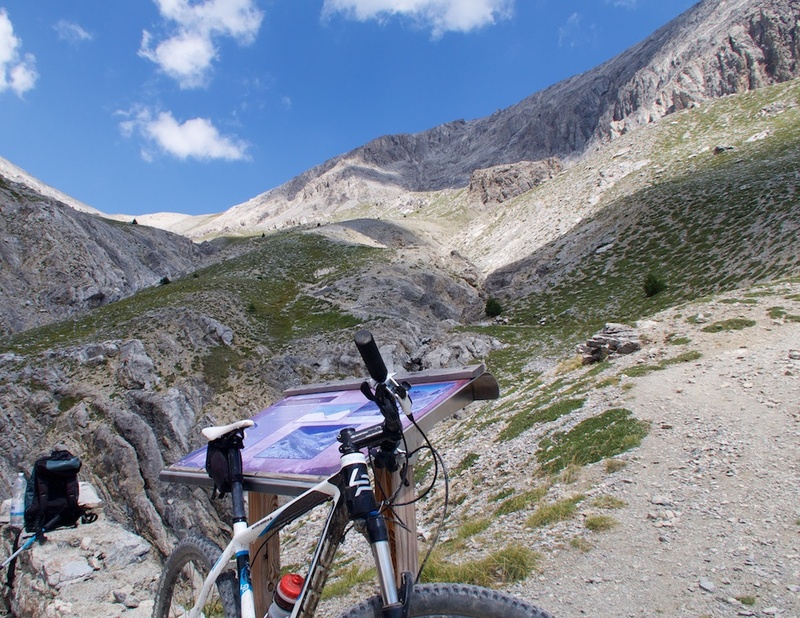 I, of course, made a detour to the Col de Montgenèvre col sign, then descended back into Italy. Note, follow the road into Clavière allows you to take the old road for a while, skipping some of the busy tunnels on the higher part of the descent. See map. Wow, this was an adventure. I had been nervous beforehand and was excited that I’d managed to make it to the summit. Remember though, to do this ride will require lots of bike pushing for even strong riders. But the reward of reaching 3131 metres is more than worth the effort. Thanks to my friends Bastien and Simon at www.cycols.com. I used their blog post for inspiration, and followed their route on my GPS. Unfortunately, this steep and slippery "road" requires a lot of bike pushing. 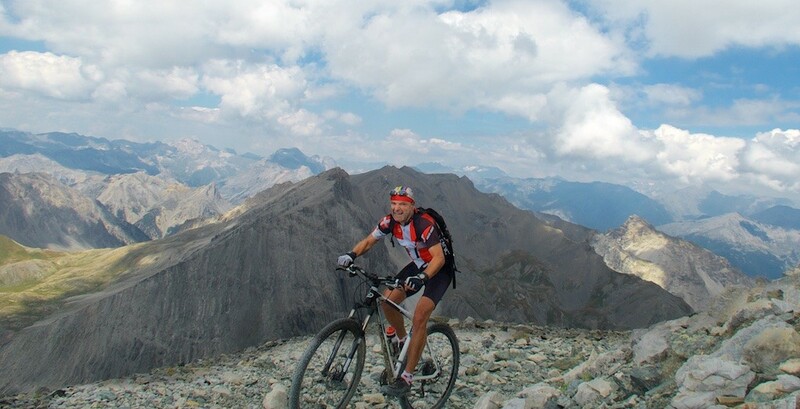 But it's never easy to get above 3000 metres on a bike. Thanks for this article. Very interesting, the military story and describing of the way of your ride. salut Will, et ben t’en auras mis du temps ? 🙂 Tu l’as fait le 8 août ? Si oui, j’étais avec Simon dans le coin (seuil des Rochilles > Briançon > Col des Ayes), on a failli se croiser !